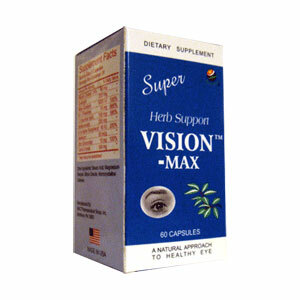 Vision Max is a herb support formula which is composed of Bilberry extract, Eye bright as well as antioxidants. This formula provides selected nutrients that both protect and help strengthen the eyes, is the most complete formulation for eyes available. Other ingredients: Stearic acid, magnesium stearate, silicon dioxide, microcrystalline cellulose. Helps protect and help strengthen the eyes. Adults, take 2 capsules a day, or as directed by your physician.